Over the last few years, I've fallen head over heels in love with the Kate Spade clothing line. Specifically, the dresses! The clean lines and bold colors really just speak to me from season to season. With the addition of cute touches like Peter Pan collars or belted waists, the designs are kicked up a notch. However, I live in the North Pole. Where shopping is limited. I'm not aware of any store in the area that carries the dress (or jewelry) line. But that doesn't mean I can't get the look locally. And at a bargain price, too! First up we have a set of really cute black and white Kate Spade dresses. I am swooning over the Hana! But honestly, both are a bit pricey if not on sale. But then we have this great dress that's on sale for $45! It's my favorite of the post! And this sweet navy and white stripe dress is a total bargain too! I will one day again live in an area that has all the good stores at my fingertips. But until then, online shopping and seeking out similar looks are just going to have to hold me over. What's your favorite dress above? Have you found any cute spring pieces lately? With snow, snow and more snow, I am daydreaming of spring. Or breaking 30. My standards are low. love the monochrome on this, so perfect and up my street. Don't know much about Kate Spade but think we havea couple here in the UK! I just blogged a few days ago about a cute dress I got on clearance from Lands End for $8. I got a fleece jacket too in spring colors. In the same order I bought another turtleneck, ugh. I am trying to look towards spring to keep my mind off all of this flippin' snow and cold. It's hard though. I like the navy and white stripe dress, I would so wear that. Cute stuff! I love Kate Spade too. Such cute pieces. Thanks for this post! 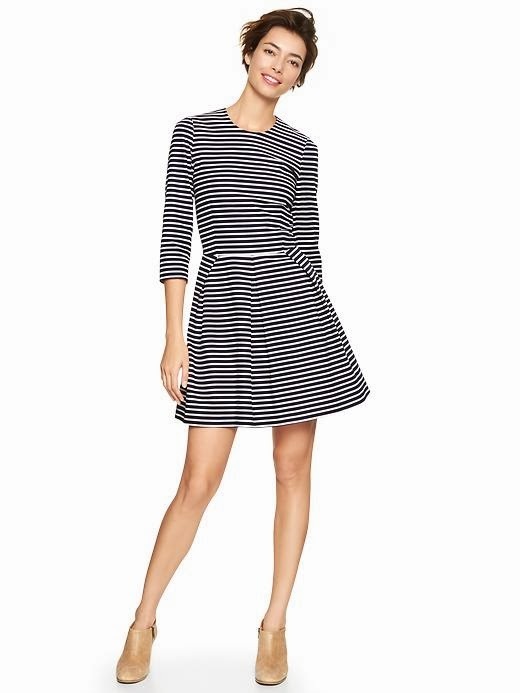 I went to Kohl's last night and got that adorable Elle dress. I can't believe it, with the horizontal stripes and all, but it is incredibly flattering!